Detail of Artemis, Athena and the Moirae (Fates) from a painting depicting the procession of gods attending the wedding of Peleus and Thetis. The goddesses Artemis and Athena ride together in chariot drawn by one white and three dark horses. Athena holds the reins and Artemis carries a bow. 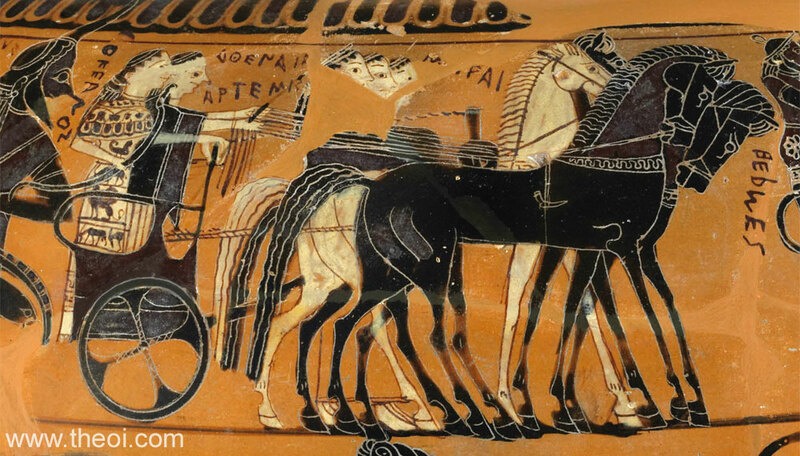 Theirs is the last of five chariots depicted in the procession--the first, third and fifth each holding one of the goddesses who would compete for the golden apple of discord at the wedding. Athena is notably the only chariot-driver standing behind her passenger on the chair which places her in the same position as her rivals Aphrodite and Hera on theirs. The three Moirae (Fates) walk beside the chariot. The deities are arranged in sympathetic groupings. Artemis, Athena and the three Moirae are all maiden goddesses, while the latter four are spinners and weavers. In the context of a wedding, Artemis and the Moirae, as well as Eileithyia and Tethys who follow close behind them (see image O1.1), are goddesses of childbirth and nursing. The Fates are further preceded by the prophetic god Apollo (see image K20.11B). Artemis is usually paired with her brother Apollo but in this scene the two maiden goddesses, Artemis and Athena, and the two bachelor gods, Apollo and Hermes (see image K20.11B), are instead paired.